Starting in late 1943, Japanese pilots encountered a new enemy: the P-51 Mustang. Despite some early successes, it quickly became evident that the new fighter was a deadly opponent. The threat only became worse with the introduction of the Merlin-engined P-51B/C and P-51D. As Japanese losses due to the Mustang increased, evaluating it became a priority for the Japanese, in the hope that a tactically significant weakness could be discovered to even the odds. It is fairly safe to assume that the Japanese were able to study some wrecks and other Mustang-related material but this was not enough for a thorough evaluation of the type's performance. The importance of fully evaluating the opponent's aircraft can hardly be overestimated. American forces were able to capture an intact Japanese Zero shortly after the battle of Midway. Bringing it back to the US, they thoroughly tested it. The evaluation confirmed what was already known: the Zero was almost impossible to defeat in a slow turning fight. However, it was also discovered that it was a fairly poor opponent at high speeds. As a result, the Americans shifted to high-speed “hit and run” tactics which allowed them to defeat Japanese air superiority. On January 16, 1945, an event occurred that gave the Japanese military a chance to become much more familiar with the Mustang. On that day, 1.Lt. 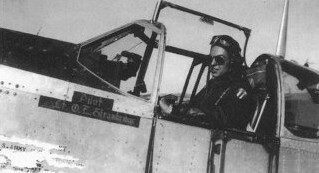 Oliver E. Strawbridge of the 26th Fighter Squadron, 51st Fighter Group, was hit by enemy gunfire and landed at the Japanese-held Suchin airfield in China. Some sources indicate he made a wheels-up landing, while others contend he landed his airplane normally. Pictures of the aircraft in Japanese hands show no obvious sign of damage or repairs. Had Strawbridge made a belly landing, the damage to the propeller and belly intake would have been very complicated for the Japanese to repair. One can therefore assume that the P-51 was captured intact. Another shot of 1Lt. Strawbridge, standing in the cockpit of "Evalina". (Photo: USAF). In any case his aircraft, a P-51C-11-NT nicknamed "Evalina", was rapidly seized by Japanese troops. Whatever damage the aircraft had taken was repaired rapidly. Hinomarus were painted over the American stars but the rest of the aircraft was left in its original scheme. “Evalina” was flown back to the Japanese Army Air Inspection Center in Fussa (now Yokota Air Base) by Yasuhiko Kuroe, a 30-victory ace. 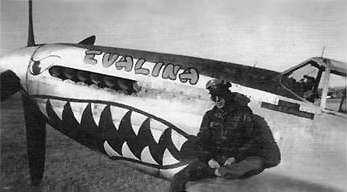 Evalina, prior to her capture by Japanese troups, carrying typical 51st FG markings. (© Gaëtan Marie). 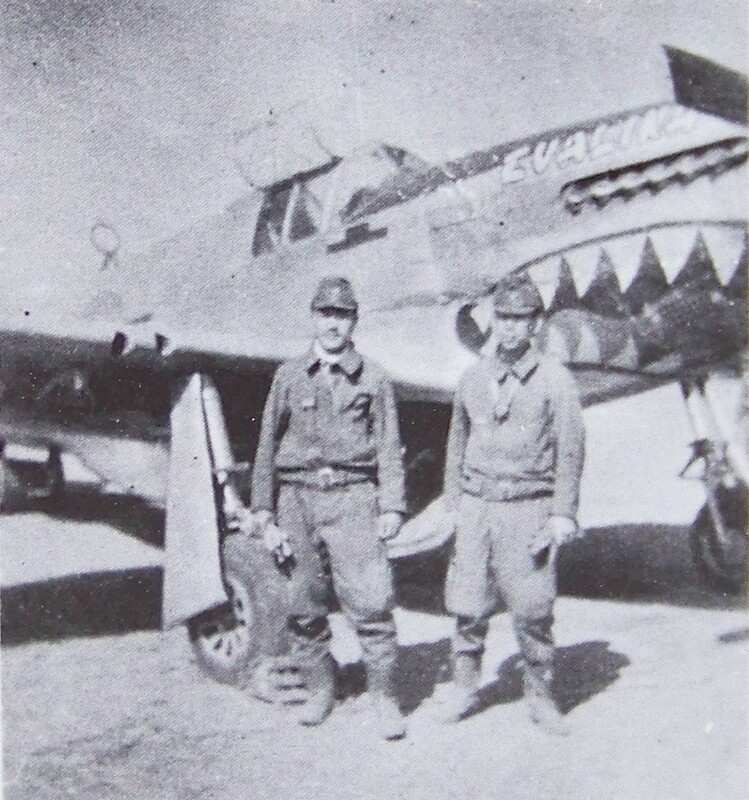 Two Japanese pilots stand in front of Evalina in Japan, possibly in Fussa. (Click to enlarge). After passing into Japanese hands, Evalina was simply overpainted with Hinomarus on the fuselage sides and 4 wing positions. © Gaëtan Marie. r fellow pilots. I did not have a great deal of confidence in my ability to fly such an advanced aircraft with my disabled leg, but I made up my mind to do my best. I flew to Omasa airfield and finally got a look at the P-51. I could see the superiority of its equipment, and its shiny fuselage with the open red mouth of a dragon. I saw several red dots on the side of the cockpit, probably recording Japanese aircraft the pilot had shot down. With the radiator under the fuselage, it looked very sleek and deadly. Evalina was finally grounded by a burned-out generator. Two P-51Ds were reportedly captured in mainland Japan in 1945, but their fate is unknown. Excerpted from Jeffrey Ethell's “Mustang, a documentary history”. At the beginning of the war, most Japanese fighter did not have a radio. Later, all fighters received radio sets but these were of poor quality, which was a disadvantage for Japanese pilots.